Magic is about influence, mystery and supernatural powers. Put differently, it is perhaps alluring twice over. You watch a great trick and think: how did that happen? It is how magicians enchant us: the thrill and simplicity shroud their mastery, even if we have seen the trick before. You even wonder: could I do it? It is Arjen Robben cutting in from the right, it is Juninho Pernambucano shaping up to take a free kick. It is Lionel Messi, in almost every single game he plays. In hindsight, Manchester United’s early dominance was almost droll, a futile exercise in negating a deterministic script. 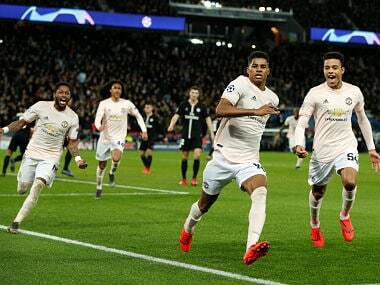 The English side enjoyed possession, penetrated Barcelona’s defence and Marcus Rashford rattled the woodwork after Manchester had moved the ball with tempo. Paul Pogba flipped the ball to the number 10, who had a clear sight of the goalmouth behind the Barcelona defence, but his dink didn’t ripple the net. It was an audacious approach from Manchester United. Norwegian coach Ole Gunnar Solskjaer wanted to repeat the blitz from the PSG away game, where his team unsettled the Parisians at the start and end of the game. At Camp Nou, the blitz lasted for just about ten minutes when Barcelona settled down. In trademark style Valverde’s team gained control of the match, slowly popping the ball about at the back, probing in the midfield and then accelerating in the attack, all before Lionel-stop-it-Messi exploded. Indeed. It was just that. A. Leo. Stop. It. Moment. Ashley Young and his archetypical clumsiness furnished the 16th-minute goal with a slapstick element, spilling possession to all but set up Messi’s devastating run and exquisite finish. His inadvertent assist will become a fait diver, because Messi took the ball and instantly knew what he was going to do. Everyone knew it. It was almost an advance warning, yet Fred, Jones and the rest of Manchester’s assorted players were powerless to intervene. 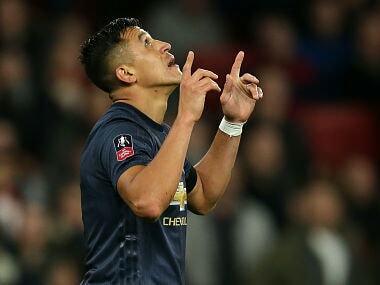 He strode across the English back four, nutmegged the Brazilian defensive midfielder, accelerated, ignored Phil Jones, glanced up and curled the ball beyond Spanish goalkeeper David de Gea. The ball stuck with magnetic force to his left foot. It has for many years. The little Argentine moulds football, shaping and sculpting the beautiful game. He also incorporates a marvelous playfulness in his game. That gaiety is quintessential to his game, because Messi never seems to take football too seriously. He reminds us all, as all great athletes do, that football is simply a game. That was abundantly in evidence after the interval. It was not that he sought to humiliate his opponents and the poor Jones, but his feints, twists, turns, accelerations and diagonals were the express exponents of his marvelous talents. In a microcosm of the game Jones pushed Messi in the back, but the Argentinean, surrounded by four Manchester United players, remained on his feet, unfazed. He beat them all with a mazy dribble into the corner, delighting the raucous fans in the stands. They loved it. Eventually, Scott McTominay had to foul Messi near flag. He just grinned. Later Messi nearly scored with an overhead kick. Barcelona’s number 10 floated in and out of the second half, but kept thinking. 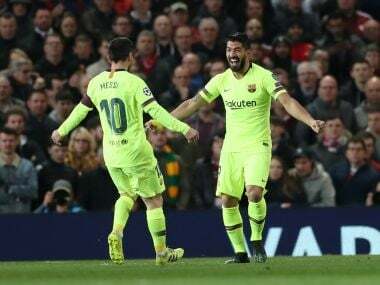 He dropped deepe*r as the entire Barcelona XI revelled in his presence and toyed with United to reaffirm what had been so glaringly obvious last week at Old Trafford - that the English were no match for this distinguished ensemble of artists. Arthur demonstrated that he could well be the successor of Andres Iniesta or Xavi. Even the embattled Philippe Coutinho partook in Messi’s magic and joy. 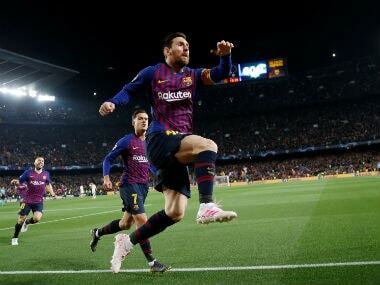 He netted the match’s outstanding goal, designed by Messi with a lucid diagonal and assisted by Jordi Alba. This time De Gea was not a culprit. In the 20th minute, the ball had squirmed under his body and into the net for Messi’s second goal. It was a horrible howler, and one that ended the tie. The goalkeeper endured and so did his ten outfield players in their strange, pinkish outfits. They had no response to the rich tapestry of a club informed by a history of excellence and superbly gifted players. 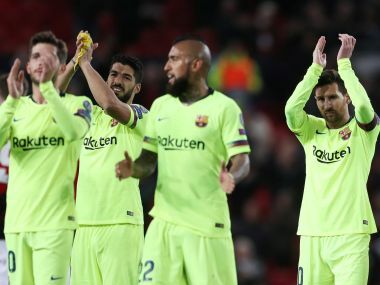 The long-term implications for Manchester United were hovering somewhere intangibly above the Camp Nou, but that was of secondary importance on a night of Messi magic that had us all watch in wonder and appreciate the everlasting excellence of a transcendent player.